View Friends List on Snapchat: Want to check the complete list of your friends on snapchat updated app? Don’t you know where the option to see the full list of friends on Snapchat? Then don’t worry we are here with some amazing ways to view friends on Snapchat update. One annoying thing about the latest Snapchat update is the removal of the “My friends” option from the profile screen. Now, how do you see all your friends in one place? This update of snapchat has confused a lot of people and in a result, even some users have deleted their app because of all these confusions. We are here with this guide to help you view the full list of Snapchat friends from an Android or iOS app. So in this article, we will show you the exact methods to view the complete friend list without any problem. Continue reading to know the methods. As we said above, the complete article will show you the best ways to view friends list on Snapchat only. Now back to the complete list of your friends. Here are two methods you can use. See the list of friends on Snapchat New update using these below two methods step by step. 1. Open the Snapchat app and go to the chat screen by tapping the chat icon at the bottom left. 2. Next, tap the new chat icon at the top right. 3. Here you will be able to see all your friends and groups. 4. At the top, you can see the Best Friends and Recent section. After that, all friends are listed and grouped alphabetically. In this way, you can view all your Snapchat friends in alphabetical order. You can see their name with their score beside the name. You cannot see the score of people who have removed you. So you can start removing them easily from your list. You have got the method 1 working 100% and if you want to check the second method as well. You are free to view this method also. As we have seen the method 1 which is quite easy to perform and get the full list of Snapchat friends. Even though you can check the second method and know the way to view in either way. Now let’s check the steps to do it. 1. Open Snapchat and take a picture at random. 2. Now press the send icon at the bottom right. 3. Similar to the above method, you will be able to see all your friends and groups. This is how we use the send option in the Snapchat account to view friends list on Snapchat. 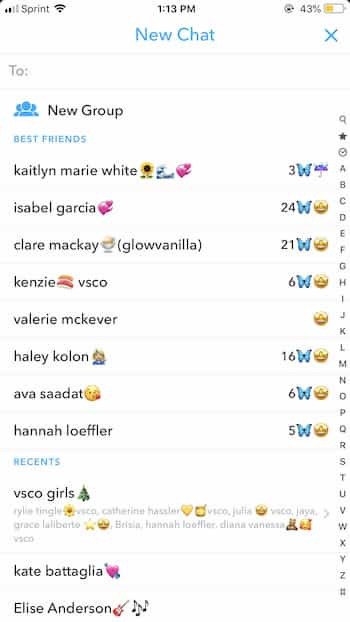 There is no such simple option to see your list of friends in the new update of Snapchat as before. 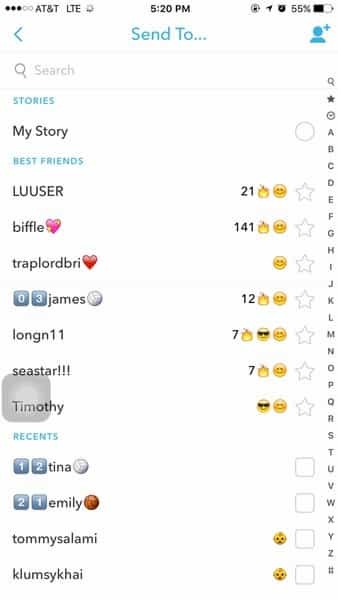 But as you can see, there are two different ways to view the complete friend’s list in seconds in Snapchat. Do not forget to share this article with your Snapchat colleagues to help them too. Hence, you have got the best working methods to view friends list on Snapchat easily within a minute. You can check both the methods and start exploring to your friend’s list. We hope you like our team effort to get this method and the article as well. Feel free to ask any questions regarding the Snapchat, we are here to help you. Stay tuned to Cracko for more awesome articles on Snapchat.